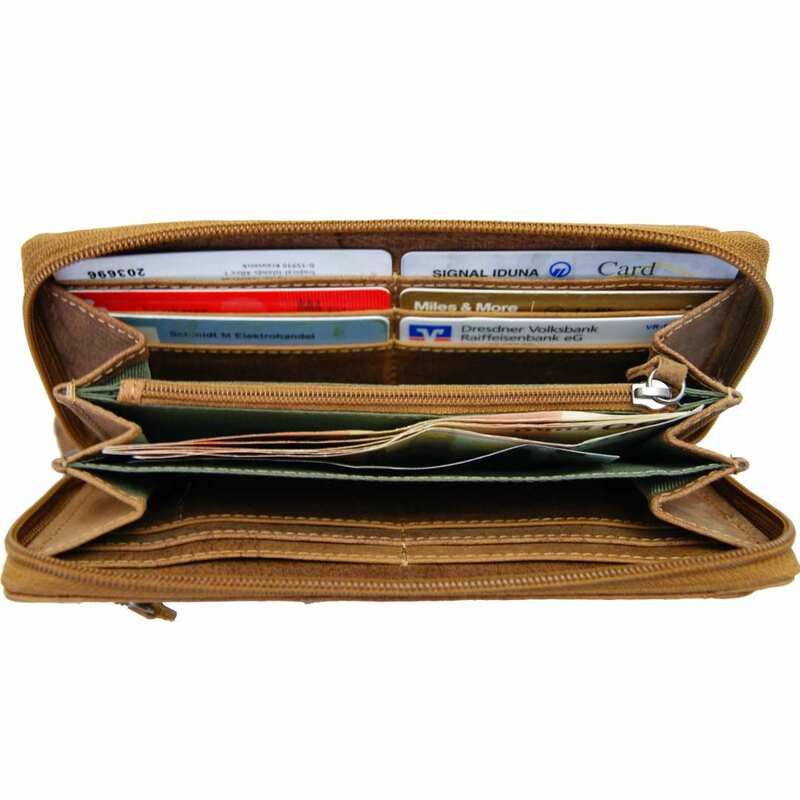 Product information "Women's long wallet OPPENHEIMER of brown leather"
The women’s long wallet OPPENHEIMER made of grassland leather is a stylish accessory that combines a nice appearance with a clever distribution of its inner pockets. Store coins, banknotes and credit cards tidily in the various compartments of the fantastic long wallet OPPENHEIMER of grassland leather. This tastefully designed accessory will impress you with its high quality manufacturing and its excellent look. An important detail can be seen on the front side of the purse: by looking closer, you will see the embossed crest of the designer BARON of MALTZAHN. This exclusive women’s long wallet of grassland leather is made in Germany and only produced in small series. Get amazed by the great combination of the OPPENHEIMER with every outfit you wear! An article also ideal as a gift! The women’s long wallet OPPENHEIMER consists of naturally treated brown grassland leather that gives this accessory a warm shade of brown. The gun-metal fittings harmonise perfectly with the leather and make the money purse even more sophisticated. Do you want to acquire a gift for someone special? Then just order the money purse OPPENHEIMER in a gift box. Every trendy woman will love it! 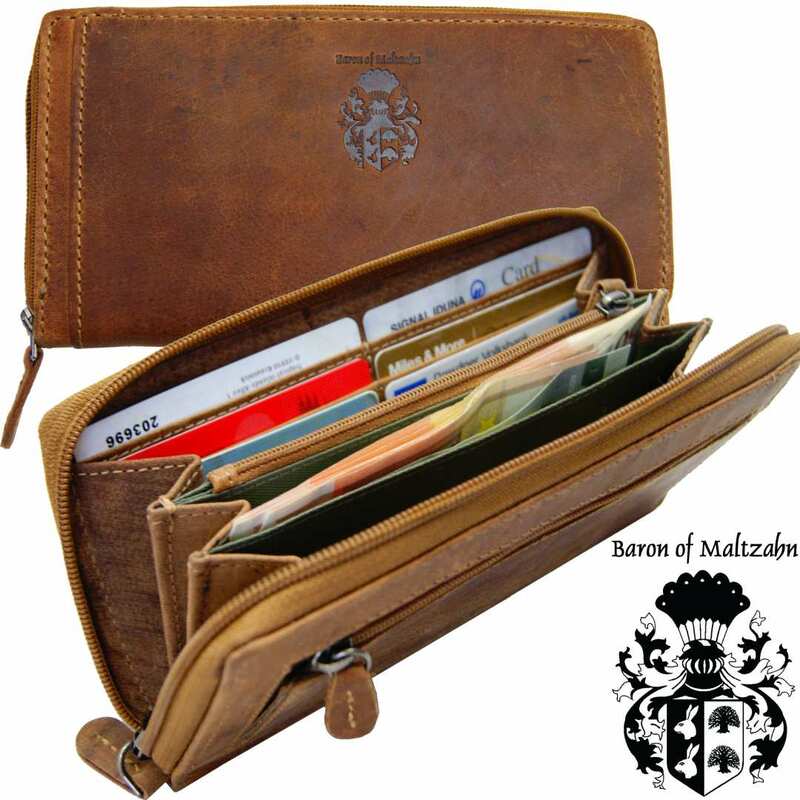 The money purse OPPENHEIMER is an exclusive piece of the Collection BARON of MALTZAHN. The high quality material has been carefully and naturally treated, which gives this accessory a very special shine. This wallet of grassland leather provides lots of space for all your necessary belongings – bills, coins and cards of many kinds - due to its generous size of 7.5 x 3.7 x 0.6 in (19 x 9.5 x 1.5 cm). The purse offers three big inner compartments, twelve card slots and a protected outer zippered pocket. 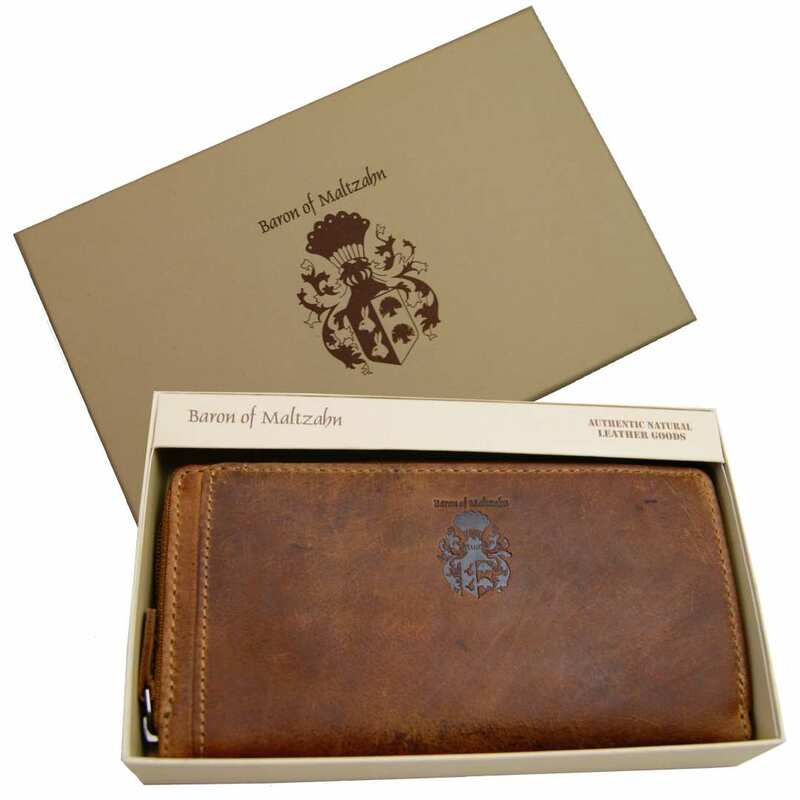 By purchasing the elegant women’s long wallet OPPENHEIMER of grassland leather, you will receive a nice gift box. That way, you will be able to give this accessory as a present and make someone you love feel really special. Take a look at our wide variety of money purses and other leather accessories for him and her, and get amazed by these excellent articles! 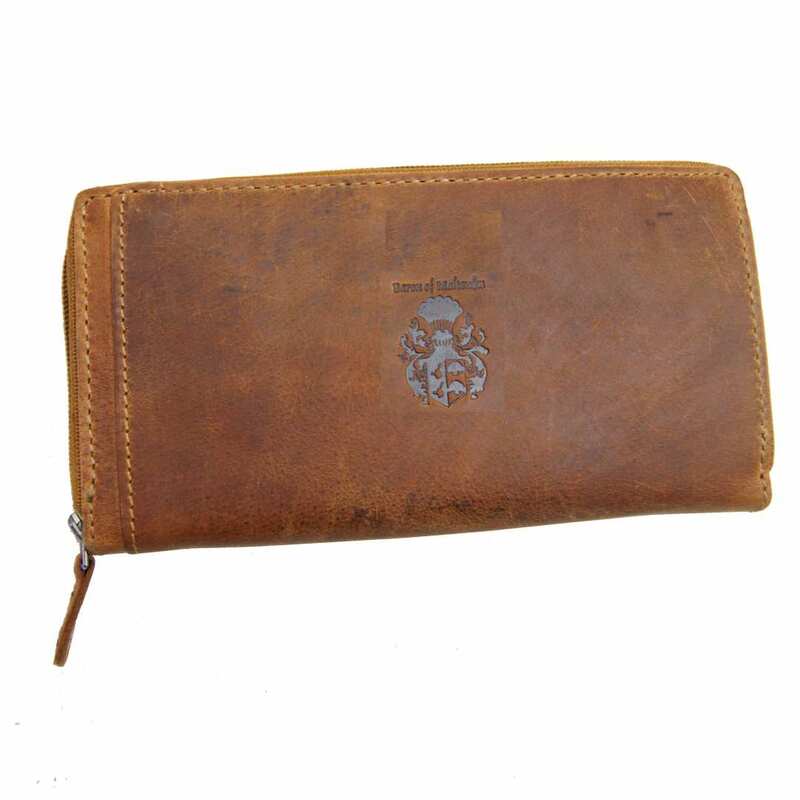 Enjoy your women’s long wallet OPPENHEIMER of grassland leather for a very long time! Reviews for "Women's long wallet OPPENHEIMER of brown leather"